I have helped in setting up visualization labs previously in grad school, but I was not involved in choosing the equipment and the details of its construction. Building a visualization lab from the ground up was a totally new experience for me. By posting my experiences, I hope that this series helps people who want to build a similar outfit. Active stereo: The projector or display modulates between left and right channels at ≥120 Hz. The glasses are synchronized usually through an IR emitter or DLP link with the display, and they modulate the polarity of the left and right sides appropriately. Passive stereo: The projector or display output is polarized differently in the left and right channels. The polarity of the glasses are static and only allow for the correct channel to be received by the left and right eyes. This reduces flicker artifacts usually seen in active stereo systems. In the past at Stanford and Penn State, we built passive 3D projection systems with two projectors, one for each eye. Here is a good description on the construction of such a system. The light from each projector passes through a polarizing filter. The viewers wear polarized glasses to restrict each eye to view the left and right channel separately. The filters and glasses can be either linearly or circularly polarized; they just have to match. This dual projector setup allows for any DLP projector to be used in such a system. However there can be challenges when initially aligning the two projectors; if they aren’t aligned properly, there will be ghosting artifacts. As a side note, I wasn’t aware that LCD projectors aren’t suitable for 3D projection systems before I started to plan the lab. This is true because the light from LCD projectors is polarized to improve brightness, and thus they need to be de-polarized before being polarized again for 3D usage. I had four requirements for a 3D projector: 1) 1080p resolution, 2) high brightness, 3) high contrast ratio, and 4) passive stereo. A projector with a high lumen rating allows for 3D content to be viewed in a room with some ambient light. Good black levels and high contrast are a must for viewing astronomical datasets because space is usually visualized as black! I wanted passive stereo to avoid buying 30-40 active pairs of glasses, costing $60-100 each. Using passive stereo also reduces artifacts and removes the restriction of being within a certain distance for synchronization. There are advantages and disadvantages for both passive and active 3D systems. In the past year, there have been several 1080p 3D projectors coming into the consumer market, but they all use active stereo. I discovered that there are two polarization modulators from DepthQ and Volfoni on the market that convert active 3D projectors into a passive systems. After dealing with dual projection systems, I thought this approach to passive stereo would be best. In the end, I chose the Volfoni modulator because of pricing ($1400 vs $6000). When I was researching different projectors, I had my eyes set on the Epson Home Cinema 5010 because of its 2400 lumen rating and extremely high 200,000:1 contrast ratio. However, this was before I discovered that (3)LCD projectors were not suited for a passive 3D system. 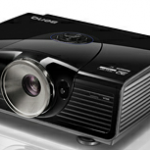 Restricting my search to DLP projectors, I found the BenQ W7000 projector to be the best fit. It has a 2000 lumen rating, 50,000:1 contrast ratio, and good black levels. It uses DLP Link to synchronize the projector and active glasses. 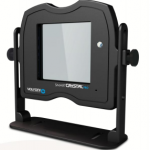 Volfoni provides a version of their modulator that has the ability to use DLP Link for a synchronization input. Passive 3D projection systems work best with a polarization-preserving (i.e. silver) screen. In addition, these screens usually have a >1 gain, increasing the perceived brightness of the image. I selected the Screen Innovations Black Diamond Fixed 113″ screen for its high gain ratio and large viewing angle. In the next post in this series, I will describe the construction of the 16-monitor display wall. Thank you for the description of a 3D stereoscopic system. I have a question on the choice of your system: For immersion purposes in the visualization of your data, would not it be better to use a curved screen ? I have noticed that some companies (Mechdyne, Barco, …) propose this type of screens. Good continuation on setting up your lab! You’re welcome! I thought about a slightly curved screen, but nothing like a highly immersive environment like a CAVE system that’s offered by Mechdyne because this lab will also host seminars and because of budget issues. SI offers a curved model of the screen I ordered. I decided against it because it’s mainly used to reduce optical distortions from short-throw projectors. For reference, the W7000 has a throw-ratio between 1.62-2.43. Yes, we have finished the construction of the visualization lab. I’ll be writing some posts in the next month or so on its configuration. How much you need to depolarize in the case of LCD projectors? Thinking in a set of two projectors, L,R, is not one of them already having a properly oriented linear polarization, so that you just need to depolarize the other? I’m not sure. When I was doing my research on projectors, I figured it was too much trouble to use a modulator with an LCD projector, and I went with a DLP projector instead.